like Google Search and GMail, consumers are demanding more and more interactivity. For a while adding a sprinkling of AJAX and localized visual refresh using jQuery UI was sufficient. The logic gets even more complex once you have multiple panels and sets of model elements. their binding to panel elements/controls, and their inter-dependencies / impact on each other when a change occurs. We need to organize our browser-side code (markup, CSS, and JS) according to their concern, i.e. model representation, business rules, display, user interaction, event handling, server interaction, etc.. This is where the notion of ViewModel and Observables come in to help us out. The scenario where a UI element subscribe to a ViewModel attribute (Value Model) is known as “Data-Binding“. This allows a clean separation between logic related to the ViewModel (calculations, derivations, retrieval, server interaction) and UI-specific presentation logic. For more details, check out the KnockOutJS site as well as the Learning Playground. Let’s dig into the basic infrastructure provided by KnockOutJS and then we’ll build up to more complex scenarios. The example ViewModel has one attribute: savingGoalAmount, with an initial value of 500. The subscribe function takes a callback function it will invoke upon any change on the value of the savingGoalAmount Value Model. The ko.applyBindings function tells KnockoutJS to start the dependency tracking. From that point on all subscribers will be notified of any changes. KnockoutJS uses the data-bind attribute to let us specify the type of binding needed. In this example we’re binding the value of the INPUT element to the savingGoalAmount Value Model. We’ll see later on that there are other types of data-binding such as specific attributes, visibility, styling, etc. although you can see the full reference in the documentation. You just need to make sure these declarations are performed before you get KnockoutJS to apply the bindings (using ko.applyBindings). You can play and run the examples above on this jsFiddle.net page. Adding / removing items in the array will cause KnockoutJS to trigger an update to all observers of this Value Model. Derived attributes, resulting from a calculation, or a business rule. Whenever either savingGoalAmount or savingMaxDuration change, the derived savingTargetPerMonth function will be re-evaluated. If savingTargetPerMonth is data-bound to the UI, the corresponding element will redisplay. Note that you can create dependentObservable functions on top of dependent observables or plain observables! Above is an example using the Accounting.js library to format our savingGoalAmount Value Model within our dependent observable so that we can display a nicely formatted currency representation on the UI. In this example, addItem is a custom behavior attached to the ViewModel which can be invoked to add new valid items. To allow other parts of our browser-side logic to access our ViewModels, we need to have a way to access them. each logically data-bound to ViewModels built on top of a local publish/subscribe mechanism using Observables. Data-binding, combined with derived data / behaviors, and AJAX will boost the interactivity level of the application. 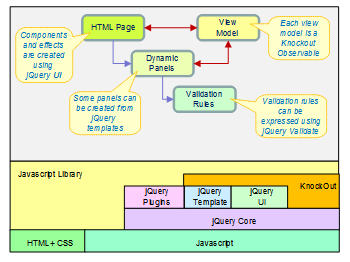 Part 2 of the series on “Creating Rich Interactive Web Apps” will be a tutorial on how to build a moderate complexity application with KnockoutJS. I am a huge fan of all the work that you put into this post. I hope that you definitely publish the second part shortly. I linked to your post on twitter @ryankeeter, under the link http://ryankeeter.com/42 . 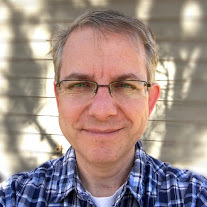 What I like about your post is that you went a step further in defining what is commonly not recognized in many organizations: the visual refresh of jQuery UI and like frameworks is nice, but what happens when you start defining intricate models on the client side? When you start pushing your weight around on the client-side, you start running into issues that are very common in OO development. I like your site, I like this post, I am pumped about the time that you put into this content. That little aside about declaring data-bindings by appending an attribute has addressed the only issue I had using Knockout, so thanks! Great post. Effing awesomeness ! Great work. I'm currently trying to put all the pieces together with client-side coding, and was looking into knockout, so your post was spot on ! Thanks for the excellent article. It had a few very helpful nuggets! Looking forward to part 2. Great article! What do you use for diagrams? I have tried a lot of diagramming tools but the one I tend to use the most is actually … Powerpoint 2007 as the drawing capabilities (and connectors) are pretty powerful, and also because you can save a given slide in .png format. I then trim / tweak the image with Photoshop. While view models and observables are very good at keeping your data and UI in sync, I never know how to handle UI behaviors. Because elements can be created dynamically (i.e. through a foreach binding), you can't easily handle user interactions with them unless you do it through ko bindings and dom manipulation functions in the view model. 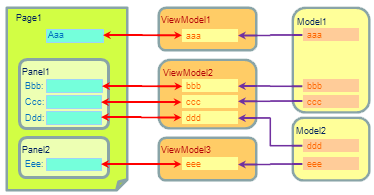 Doing it that way gets really complicated when an object in your view model can be displayed in multiple places at once. A sidebar item can be clicked to show a more detailed view in a center column, for example. Now you have two completely disparate UI elements being controlled by the same view model. A "details" view might be handles as a drawer in your center column, and a tooltip in your sidebar. You can't just have a showingDetails() observable that controls the visibility of the child details element or when you open the drawer in the center column the tooltip in the sidebar pops up too! So you have to have two observables. Add more use cases, making device or resolution dependent elements, and your view model starts getting ridiculously complicated. Anybody have any ideas or want to share how they're doing it?